"AntikytheraMechanismSchematic-Freeth12" by SkoreKeep - Own work. Licensed under CC BY-SA 3.0 via Wikimedia Commons. 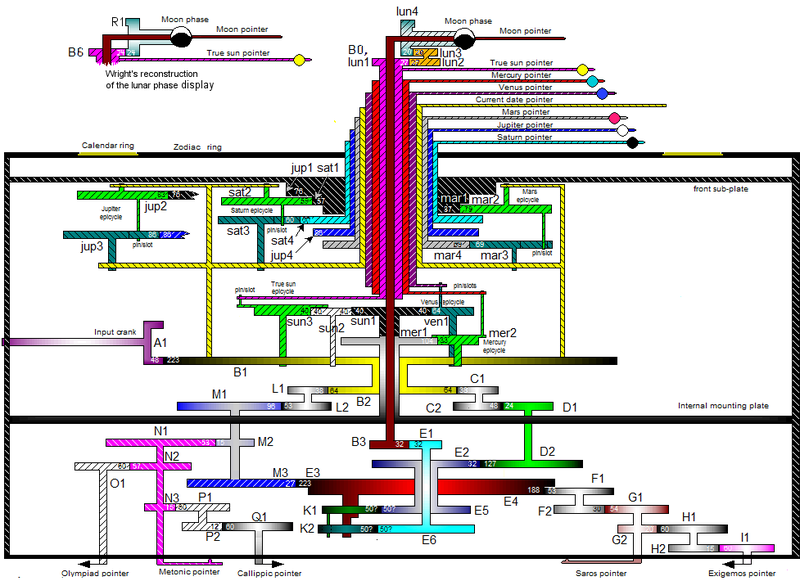 You would think the pretty little diagram would make it easier to understand, but obviously not. Off the coast of the island of Antikythera in 1901, while excavating a ship-wreck, a group of archaeologists and divers pulled up a hunk of rock, along with a whole host of other minutia thought to come from the isle of Rhodes, during the time of Julius Caesar. The hunk of rock wasn't particularly interesting, so it went into storage. Until about a year later when an archaeologist noticed a gear, embedded in the rock. He believed it to be some kind of astrological clock. But given it's complexity, and their understanding of the other things taken from the site, it fell back into storage. Until someone else picked up the trail in 1951, but even with interest it was still 1971 until they took x-ray and gamma-ray images of the 82 fragments. Hundreds, nearly thousands of years in the silt at the bottom of the ocean, and the nearly another hundred in a lab, and still the best we can guess, the Antikythera Mechanism was being taken back to Caesar as a spoil of war. We don't know how many tries it took to create the thing, or who, or how. We're not even entirely sure what it's supposed to do--though totally check out the theories, if you're up for the science content. Things like this in science always make my psuedo-science brain buzz (for a fun time, check out Mischa Collins in Stonehenge, Apocalypse, which I'm almost positive mentions this little beauty and even if I'm wrong, it's still worth a watch). There are so many things about the ancient world we don't really understand yet, and I'm not an 'alien assistance' kind of girl, but I always wonder when we're going to fill those holes. Oh, great, a new shiny for me to investigate.